While most of the dresses and skirts in my closet work for bicycling, there are some that are better designed or specifically designed for riding a bike yet are still office appropriate. And the skirts don't have to be full and flared either. There are some pencil or A-line pieces out there that could be classic staples in your wardrobe. Here are my four picks of skirts fit for bicycling. The back vent zippered closure is quite clever. Unzip to ride and then zip up at your destination. Plus side seam pockets to store your stuff. eShakti will remove the pockets and adjust the garment to your height at no additional cost. Yet you can customize the length to your taste for a small price. A pencil skirt fit for bicycling? This pencil skirt has a vent and zipper in the back so you can pedal freely on the bike! Pockets can be removed at no additional cost. The skirt length can be customized for a small price. Get $40 off your first order at eShakti using my referral link. Looks like a skirt from the front but it is a skort. The functional side and back pockets can be removed at no additional cost. Wear this skort with a mustard or pink top or tights to make the hounds tooth pattern pop! It's a skirt - no a skort! Looks like a skirt from the front. Have the look of a skirt but the modest comfort of shorts. eShakti will remove side pockets for no additional cost. Skort length can be customized for a small price. Get $40 off your first order at eShakti using my referral link. In gray or black, this skirt has a classic pencil shape. It's fitted when you zip close the panels. Unzip them to reveal hidden godets that allow for a wider range of motion when pedaling. Stored inside one of the functional back pockets is a reflective flag you can deploy when riding at night. I have one of each color in my wardrobe! Designed specifically for bicycling yet still office appropriate. Zipped up, it fits like a classic pencil skirt. Unzip to reveal hidden panels to give more freedom of movement while maintaining modesty. Can you kick in your pencil skirt? Tucked inside one of the back pockets is a reflective flag to reveal when riding at night. They don't believe I rode 10 miles in a skirt but I did! 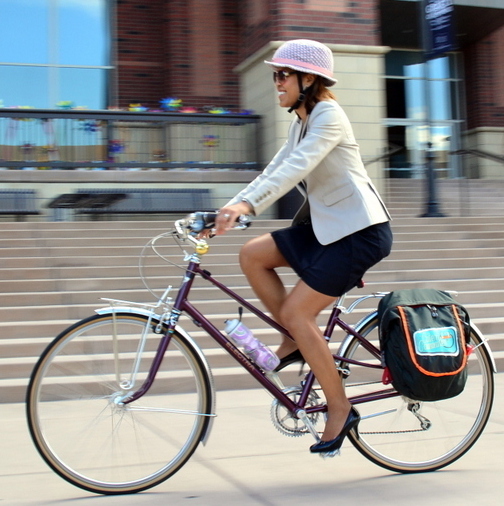 Want your own Betabrand Bike to Work Skirt? Use my referral link when purchasing from Betabrand. You save $15 and I get $15, that's a win-win! Available in black, gray pin-stripe or navy pin-stripe, this A-line skirt has a short built-in. Plenty of pockets (hidden back pockets and in the short leg) to store your stuff! It's a skirt and shorts with added features. Want Your Own Work-It Skort? Use my referral link when purchasing from Betabrand. You save $15 and I get $15, that's a win-win! A pocket in a skirt is so handy! Should you order from eShatki or Betabrand, use the links below to score yourself a discount. Use the link above to receive $40 off your first purchase of $70 or more ($30+ after referral discount) at eShakti and I will also get $40 off my next purchase. Use the link above when ordering from Betabrand. You save $15 and I get $15, that's a win-win! You don't have to bike in performance clothing or pants, especially if you are just riding around town or to the office. I usually ride in a skirt or dress and I prefer to for comfort and freedom of movement. And with clothing options like the ones I pointed out above, it makes it that much easier to bike in a skirt that is also office appropriate. Also see related post for tips: How to Cycle in a Skirt Happy riding!! You can ride a bicycle in a pencil skirt to work!